Thank you for everything! I would really love to say how great our driver was the day of our wedding on 1/1/11. He was amazing, he held my dress for me and always put me as his priority. The champagne and everything was perfect, thank you so much for everything! I just wanted to give you some feedback about my experience with Border Limo on Saturday night. To put it simply, we loved it. We had such an excellent experience with your company! Our driver, Steve, was highly professional, polite and a true gentleman. I will recommend Border Limo to everyone since we had such an awesome experience! It turns out my sister, who is getting married this Sunday, is using Border also! I had no idea she was using your company when I booked with you. Thanks again! We truly enjoyed our experience! We absolutely loved the service, Keith (I believe that was his name) was perfect and we felt so very special! We loved the champagne toast and the red carpet, super nice! It was the perfect touch to our blessed day! We are so glad to have chosen Border Limousine service, it couldn’t have been more perfect! 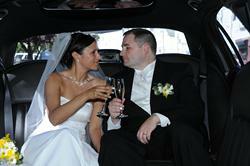 I booked a towncar and a limo for my wedding in Boston 5/29/2010, and I just wanted to say thank you for the great service we received. If special thanks could please be passed on to our towncar driver John Stewart, who was so nice, so friendly, so patient, and even stood in heavy rain to open and let us enjoy our bottle of champagne, that would be great! He’s definitely an asset to your company. The driver with him that took my friend to Manchester was also of the same caliber as well as the one who initially picked us up for the train station. All in all, I would tell anyone that Border Limo is a class act!!!!!!! Many thanks to them and to your company.